This collection contains many sheets from the 16th century and a rich variety of cards of the 17th-20th centuries. It is documented in the exhibition catalogue Koreny, Fritz "Spielkarten, ihre Kunst und Geschichte in Mitteleuropa", Wien 1974 (see Playing-card bibliography). No cards on display, visits are by appointment only. No reading room available yet. A collection of 19th century playing-cards from Viennese makers. No cards on display, visits by appointment only. A small but fine collection of 19th century playing-cards from Austrian makers. This collection is documented in the exhibition catalogue: Dornik-Eger, Hanna "Spielkarten und Kartenspiele", Wien 1973, (see bibliography section). The collection of Mr. Pachinger who collected local cards (from Upper Austria) during the second half of the 19th century. This collection is documented in: Kroppenstedt, Erika und Detlef Hoffmann: "Inventar-Katalog der Spielkarten-Sammlung des Stadtmuseums Linz", Bielefeld 1969 (see bibliography section). The museum was inaugurated in 1969, just before the amalgamation of the surviving factories of Brepols, Van Genechten et al. 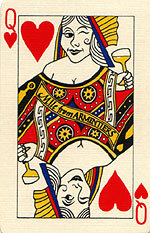 as Carta Mundi (1970). The collection includes mush archive material from these makers, including examples of their old machinery, which are now on permanent display along with a small historical exhibition on the ground floor of premises which formerly belonged to the card-maker Mesmaekers. The remaining area provides ample space for mounting temporary exhibitions, two or three times a year, on various occasional themes. The collection has continued to grow, and though still dominated by Turnhout and other Belgian products, has interesting material from other countries and is currently being doucmented on a computerised database. The museum is open on Sundays and several afternoon (more often in summer months) and there is a museum shop. In conjunction with the society "Turnhout Wereldcentrum van de Speelkaart" the museum publishes a quarterly magazine (mainly written in Dutch, with some articles in French) "Kontaktblad van het Nationaal Museum van de Speelkaart". One of the world's finest collections. About 4,000 items (packs, sheets, single cards, wrappers, woodblocks, etc.) and many books. The "old stock" goes back to Roger de Gaignières who bequeathed his collection of tarot cards (among which the celebrated so-called Charles VI Tarot) in 1711 to the then Royal Library. Additions were made during the 19th century, but major accessions came with three donations in the 20th century from Georges Marteau (1916), Henry-René D'Allemagne (1950), and Paul Marteau (1966) (the Marteaus had owned the firm of B.-P. Grimaud). The collection is international in scope but French in emphasis. The choicest material is housed in the Réserve room which can be visited on Tuesday and Thursday mornings. Poorly documented. This collection has as its foundation the donation in 1930 of the collector Louis Chardonneret and has much interesting material. From 1986 the collection has grown, particularly by acquiring the collection of mainly modern cards formed by the late Robert Thissen and some rare early cards. A new building now houses the museum, which stages both permanent and temporary exhibitions, as well as talks and demonstrations. The museum is open to the public from 10h to 19h on Wednesdays, Saturdays and Sundays. The Musée des Arts et Traditions Populaires (National Museum of Folk Arts), open since 1972, has an interesting collection of playing cards mainly focused on French cards. It is housed in the Iconothèque (Picture Department). A computer catalogue is in progress. The MNATP is in the course of moving to Marseilles. The Rouen City Library houses the Leber Collection, a large collection of books, prints, broadsheets, and playing cards, which were acquired in 1838. The playing cards are kept in three portfolios ("cartons"), with separate additions, and they can be consulted in the reading room (call number: Leber 1351 (portfolios), Leber 1352, Leber 1353). Admission to the library is free (Tuesdays to Saturdays, with closing time from 12 to 14), but an identification is needed. There is an old printed catalogue (published by Leber himself) and an updated short list by Thierry Depaulis. Lodged in a Renaissance palace (Maison Diamantée) in the old Marseilles, the museum is devoted to local arts and crafts. When the firm of Camoin ceased activities in 1970 they presented their old stocks, blocks, plates, tools, and an impressive display furniture to the museum. Most of the cards and printing blocks are exhibited in the Camoin room upstairs. At present (2004) the museum is closed for renovation and will re-open in the near future. This museum was originally that of the A.S.S. playing-card company, formed after World War II from the remnants of the pre-war Altenburger und Stralsunder Spielkartenfabriken (V.A.S.S.) company (see entry for Stadtverwaltung, Altenburg below). The company relocated in Leinfelden, near Stuttgart, and began again to form a museum collection in 1950 by acquiring the collection of 15th and 16th century cards formed by Martin von Hase over a period of almost 30 years. in 1972 the A.S.S. museum purchased the collection of the Bielefeld Spielkartenfabrik. This assemblage had a distinguished history of its own: it was founded in 1950 and augmented by the acquisition of the collection belonging to the art historian Werner Jakstein. Other private collections came to the Bielefelder museum in later years—for example, in 1956, the collection of Indian cards formed by Rudolf von Leyden—until it could count in 1965 approximately 3,500 packs, many blocks and plates, and a playing-card reference library numbering 970 volumes. The purchase of the Bielefelder collection by A.S.S. was followed in 1974 by the official inauguration of the Deutsches Spielkarten Museum in Leinfelden; the museum is now a branch of the Wurttemburgisches Landesmuseum (in Stuttgart). The collection is an important resource for the study of playing-cards of all periods and places, particularly 16th century cards and sheets, 17th century French-suited cards made in Germany, cards of East Asia and India, and 20th century German standard cards. The DSM has staged a series of exhibitions, roughly one per year, usually on a particular aspect of the collection, taking the opportunity to publish a catalogue of that part (see bibliography section). A recent acquisition has been the collection of the distinguished collector and historian Erwin Kohlmann. A catalogue of the complete collection is under preparation. The Vereinigte Altenburger und Stralsunder Spielkartenfabriken (V.A.S.S.) firm of playing-card makers established a playing-card museum in 1923 in Altenburg, Thuringia; however, its extensive holdings—including over six thousand packs and hundreds of blocks and plates—were seized by the Russians in 1946 and shipped to Russia. The fate of the collection is still unknown. The factory survived as the VEB Altenburger Spielkartenfabrik, Altenburg; it is now known as Altenburger Spielkarten, and is owned by F.X. Schmidt of Munich. The post-war collection which has been housed in the castle since its inception in 1950 is the property of the town. The collection material is predominantly German, and includes many fine examples of the Saxon pattern. The material on permanent display has suffered from too much exposure to strong sunlight and many items have faded badly; a new permanent exhibition has been mounted in 1995. This is the major toy museum in Hungary, but has some playing-cards. It recently staged an exhibition of Hungarian playing-cards which toured all over Hungary. This public museum opened in 1991. It is located in Omuta city, where the first Japanese playing cards (Portuguese style) were produced in the end of the 16th century. The collection contains about 10,000 packs; circa 6,000 foreign ones (including Tarot, Ganjifa, Chinese cards, etc.) and circa 4,000 Japanese (of various kinds: Tensho, Unsun, Iroha, Hanafuda, etc.). As a matter of course, the collection of Japanese cards is definitely outstanding. It includes very old & valuable cards, some of which were illustrated by famous artists (Hokusai, Hiroshige, etc.). And in addition, several old cardmaking tools are also exhibited. Part of the collection can be seen in the catalogue "KARUTA NO SEKAI" ("The World of Playing Cards"). Open 9:30 - 17:00. Closed Monday (or Tuesday instead if Monday is a holiday), the last Thursday of the month (Friday instead if Thursday is a holiday) and 29th December - 3rd January. The museum is dedicated to the memory of the Dieudonnés who were cardmakers in Grevenmacher during the 18th and 19th centuries. Jean Dieudonné, who came from Metz, settled there in 1752. (Members of the family later emigrated to France where they set up cardmaking firms in Orléans and in Angers until 1952.) The museum holds many sheets and printing plates together with a great number of tools. This has allowed the city of Grevenmacher to display a reconstructed workshop as it was in the early 19th century, with its presses, stencils, plates and other tools used to make playing cards. This has a small but interesting collection and no permanent display of playing-cards. This has interesting collection of cards mainly in the realm of taxation. The collection was catalogued in the publication "De Speelkaarten collectie van het Belastingmuseum" (see bibliography section) when a temporary exhibtion was held. No permanent display. The collection of playing-cards, xylographic and lithographic plates, contemporary tools, wrappers plus a specialised library which form the Fournier collection was amassed by don Felix Alfaro Fournier, the grandson of the firm's founder, beginning with two decks found in his grandfather's writing desk after his death in 1916. It was greatly enhanced by the purchase of the De La Rue collection when it came up for auction at Sotheby's in London in 1970. It has also been enlarged by public donation, both by private individuals and by other playing-card manufacturers. In 1984 the Fournier collection was sold to the Provincial Council of Alava, and in 1994 was relocated in the specially renovated and more spacious quarters in the Palacio de Bendaña, a Renaissance palace of the sixteenth century. It contains about 20,000 packs of cards, among other items. Museum with a department interested in history of Swiss cards, and owns a collection. Study of Solothurn cards in progress; museum also concerned with Swiss cards generally. The Museum "zu Allerheiligen" (of All Saints) owns some 8,000 different packs and fragments, from around 1500 until now. There is a specialised library with over 300 titles. The local production, particularly that of Schaffhausen from 1760 on, is particularly well represented. One of the museum's highlights is the Kümpel collection which was acquired in 1999 and contains playing cards mainly from the 18th and early 19th centuries. The playing cards are not on permanent view, but there are special exhibitions from time to time. However, they can be seen on appointment. Among the c. 17,000 pieces which are mainly printed books is a small collection of playing-cards which ranges extensively and includes Indian cards painted on ivory, Chinese cards, and cards from most Western European countries including some very early fine examples of engraved and woodcut German cards. The catalogue of this collection was published in 1840. In addition the Bodleian Library commemorated the bequest with an exhibition: see "The Douce Legacy: an exhibition to commemorate the 150th anniversary of the bequest of Francis Douce (1757-1834)", Oxford 1984. This consists of 20,000 books and one of the largest collections of ephemera in existance. Johnson was Printer to the University of Oxford, 1925-1946. The collection was transferred to the Bodleian in 1968. Playing-cards are to be found in the section on games and pastimes. See "The John Johnson collection: catalogue of an exhibition", Oxford, Bodleian Library 1971. This was bequeathed in 1934 and consists of c. 3,500 items rich in works relating to the history and use of playing-cards and card games. The collection covers all periods. See "The Jessel Collection." Bodleian Library Record, 1 (no. 7), 1939, p. 116-118. Anyone wishing to use the Bodleian Library must first become a member of the Library. Reader's tickets may be obtained from the Admissions Office, Clarendon Building, Broad Street. Full information from the Admissions Officer, tel: +44-(0)1865 277179 / 277180. The old collection of some 300 items was brought together and catalogued in 1876 by W. Hughes Willshire. It contains many early examples of playing-cards from the hands of print-makers, but is especially strong in the series of cards issued in London in the late 17th and early 18th century, dealing with current events and fashions, which are described at length in Willshire's catalogue (see bibliography section). Some more recent acquisitions have been interpolated in this collection. In 1875, the museum acquired the collection of Lady Charlotte Schreiber, but returned to her executors the duplicate material; the items retained were catalogued (rather tersely) by F.M. O'Donoghue in 1901. They have not been added to, and are kept apart from the old collection. This colection contains a remarkable selection of German material, as well as cards from other countries. The collection is rich in `standard' cards of the 18th and 19th centuries, though not catalogued in such terminology. Because each variety of standard card is exemplified by packs and sheets produced by different manufacturers in varied geographical locations, the collection offers a wealth of comparative material. There is no permanent display, but individul items can be inspected on application to the Print Students Room. The oriental items have been transferred to the appropriate Oriental departments. The collection was founded in 1907 by the donation of the private collection of 600 items (including some books and other materials) by Past Master of the Worshipful Company of the Maker of Playing Cards, H.D. Phillips. It was deposited at Guildhall Library in 1908. International in scope, the collection was particularly rich in English pictorial cards of the late 17th and early 18th centuries, but also boasted some very fine and rare Japanese items, as well as interesting Spanish and German cards. Since 1926, the collection has been augmented by other material acquired by the Worshipful Company and now has c. 1,100 packs of cards. Besides over 300 examples of the packs issued annually by the Company, the collection has c. 300 other English packs and some 450 packs from other countries. All the cards have recently been catalogued by John Berry. There is no permanent display, but items can be inspected at Guildhall Library with the approval of the Clerk of the Company. The Library has also recently become the depository of the collection of historic cards formed by the former playing-card makers John Waddington, which is in the process of being catalogued. The V & A has a small collection of playing-cards, acquired over the years. Some of the cards have been bought, but most are the gifts of members of the public and other institutions. The collection continues to grow with examples of modern packs, and contains unique material such as designs by D.G. Rossetti, C.F.A. Voysey and W.S. Coleman, as well as printing blocks, duty wrappers, and other peripheral items. See "Playing Cards in the Victoria & Albert Museum" by Jean Hamilton, which catalogues 236 of the items (see bibliography section). The Indian cards in the collection were catalogued in 1982 (see "Ganjifa, the playing cards of India", bibliography section) and are housed in the appropriate department of the museum. This library, located on Yale University's campus, houses the Cary Collection. The playing-cards, card sheets, wood blocks, metal plates, ephemera, and prints acquired by Melbert B. Cary, and bequeathed to the Yale University Library by his wife, form one of the world's distinguished collections of such materials. The Collection contains well over 1,000 complete or partial packs of standard playing-cards, approximately 200 sheets of standard cards, and about 30 blocks and plates used for the printing of standard cards. There is a holding of similar size for non-standard cards. The collection contains standard cards from 16 European countries and 6 countries in the Western Hemisphere, as well as non-standard cards from 23 European and 3 Westerm Hemisphere countries, and its content represents over 500 years of cardmaking. Sadly, this museum closed its doors without warning on Tuesday, October 30 2001. There is no news yet as to what may happen to the museum's collection. The USPC Co, the world's largest maker of playing cards, has maintained a collection since the 1890s. Its nucleus was acquired from George Clulow, a graphics designer in England. Catherine Perry Hargrave wrote "A History of Playing Cards" (1930), based primarily on the collection (which she catalogued). The artifacts span over 500 years and provide a global survey, especially strong in non-standard packs. A related library contains about 1000 books, some dating as early as the 1500s. "Yankee (26th) Division", 1933. Limited editon pack commissioned by Melbert B. Cary Jnr. to commemorate the unit he served in during WWI, and printed at his Press of the Woolly Whale. The artist was Alban B. Butler Jnr.